You don't have to be a golfer to appreciate the magnificent views at the Torrey Pines golf courses in La Jolla, California. These seaside courses meander along the coastline, and are bordered by deep canyons with thick vegetation and abundant wildlife. High cliffs overlooking the Pacific Ocean provide the breathtaking views for which Torrey Pines Golf Course is widely known. 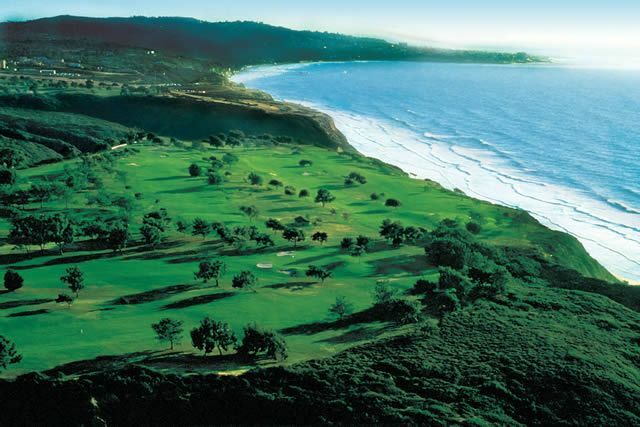 Originally envisioned and designed by William F. Bell Sr. in 1953, Torrey Pines is a 36-hole golf facility built over land that a few years earlier, during World War II, was used as military training camp - Camp Callan. Mr. Bell died in 1953, and it was his son William who finished the design and construction of these beautiful golf courses, which opened to the public in 1957. They were named after a torrey pine tree indigenous to the area, whose distinctive characteristic is its clusters of five pine needles. In 1999, the Torrey Pines South Course was extensively renovated by world-renowned golf architect Reese Jones, nicknamed the "US Open Doctor" due to his continuing occupation as redesigner of golf courses that would later host a United States Open. Torrey Pines South was selected by the United States Golf Association to host US Open on this course in June 2008. 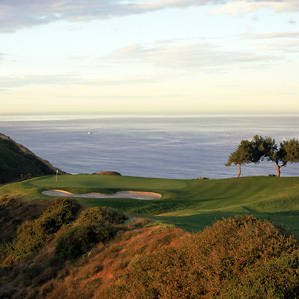 The most popular and most difficult of the two courses is Torrey Pines South, particularly after its 1999 renovation. Rees Jones nearly doubled the number of bunkers along the layout, and completely rebuilt the greens which now feature more pronounced undulations, and room for a variety of hole placements. Newly designed teeing areas extend the length of this course to up to 7,600 yards. When the sea breeze picks up by mid-morning, or rain or fog sweep the coastal areas, playing the South from the back tees is a challenge even for the best of golfers in the world. The new par-3 third hole is a live postcard showing a green perched at the edge of a canyon, with the ocean, coastline, and La Jolla in the background. The twelfth hole is a monster par-4 of 470 yards, into the wind, that runs parallel to the Torrey Pines glider port. In addition to having to deal with the elements and the intricacies of their own swing, golfers must also deal with the distractive view of hang-gliders and para-gliders, soaring and hovering at the edge of the cliffs. This is not a golf course for the beginning golfer, unless that golfer enjoys looking at huge numbers on the score card and has predilection for raking bunkers. Selecting the set of tees to match the golfer's ability will ensure a more gratifying golf experience. You will have to drive the ball long and straight to score well on this course, and you should practice fairway and greenside bunker shots with a variety of clubs before your visit. Torrey Pines South is featured on TV on Saturday and Sunday during the Buick Invitational every February. Torrey Pines North Course is "the easy one." Shorter than its brother and less protected by modern renovation, this golf course is more popular for the less-experienced golfer, but will still put up a good fight for the better ones. It is played by the PGA Tour professionals once during "the Buick Invitational," half the playing field on Thursday, and the other half on Friday. For some, the Torrey North is more scenic than the South, having more picture-perfect opportunities along the track. The view from the elevated sixth tee towards La Jolla has been captured by photographers and painting artists from all over the planet. When you reach the seventh tee, you are presented with a fantastic view of the Pacific with Blacks Beach and deep canyons in the foreground...if you look back. If you look ahead, you will see a narrow fairway bordered by a cliff on the left and trees on the right, climbing uphill to reach a green partially surrounded by - what else - torrey pines! Simply a beautiful and challenging golf hole. The view from the similarly elevated twelfth tee is just as majestic. This course is bordered on its north end by the Torrey Pines State Reserve, which is an extensive area that includes protected local fauna and flora, as well as hilly hiking paths. The facilities underwent substantial changes through the years and are now considered a major local attraction, a "must play" golf course for visiting golfers. In addition to a fully stocked and award winning Pro-shop, The only Five Diamond hotel property in the city of San Diego sits perched above the 18 green. The Lodge at Torrey Pines earned the AAA Five Diamond Award for 2003 after only six months in business. Right next door overlooking the 18th fairway of Torrey South is the Hilton Torrey Pines Hotel. Both of these first-class lodging facilities have sweeping views of both Torrey Pines Golf Courses framed by a background Pacific Ocean Views and glorious sunsets.